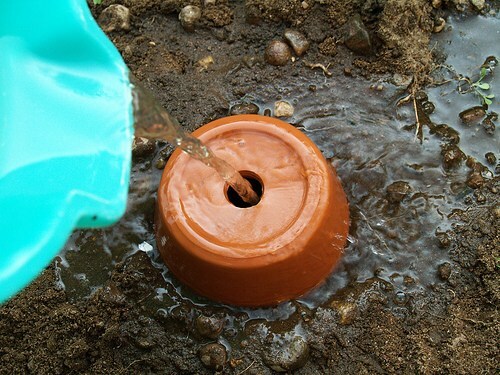 With water becoming such a crisis around the world, we saw this great tip for making your own Olla water pots for irrigation in your garden or landscape. Many are using irrigation systems but here you can create your own whether you need a lot or a few areas. We love the idea of planting these in the center of a garden pot for a manual watering system. 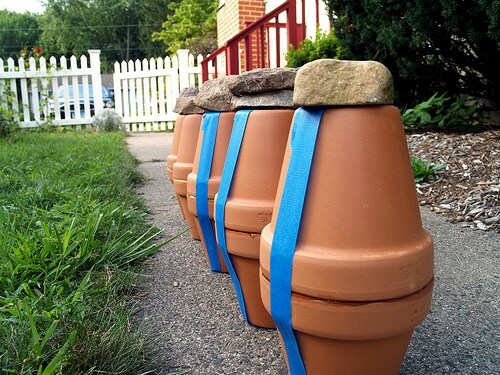 Take 2 terracotta clay flower pots. Use the size that best fits your needs. These can be as small at 3" or as large as 18". Cover the hole with silicone, or any material that will plug the hole. Apply waterproof glue around the rim of the pot. Turn another pot the same size upside down, do NOT plug that drain hole but set on the top of the base pot where it is glued. Apply a large rubber band, piece of string or whatever to hold them together. Let them dry completely. Now you should have 2 pots top to top. With the bottom terracotta planter's hole plugged. Place in the center of a garden pot and place your plant materials around it. Cover with soil so that only the hole in the top is showing. This is make the roots circle the pot where the water will leach out slowly. Fill the pot with water. Check every couple of days to see how much water is being used. You can temporarily plus the top hole with a rock or cork piece. Turning a clay saucer over and use as a top can work also. This will slow the evaporation down. This will keep the water cool and stable, letting it seep thru the pots into the soil and onto the roots. Now of course if you want to buy our watering pots, they come in many sizes and shapes to meet all your watering needs. Click here. Read more.....Create a fragrant garden in a pot. Read more.....Create a fairy garden in a pot.